This unusual 4-stroke 9-cylinder single-row direct-drive diesel radial engine has some interesting features, such as no ignition system. Instead, compression ignition fires the cylinders filled with air and injected diesel fuel spray. Diesel fuel has more carbon content and is more calorie-rich per gallon than aviation gasoline. That can extend aircraft range over a gasoline engine, for a given fuel tank capacity. In other words, there was favorable specific fuel consumption. However, the noxious exhaust emissions, including abundant carbon soot, from an untreated diesel engine can be annoying. Diesel aircraft engine development began at Guiberson, (an oilfield equipment company) in 1930 in Dallas, Texas. A subsidiary was set up to focus on these engines. Mr. F.A. Thaheld was the radial diesel engine designer for Guiberson. Engine construction was contracted out to the Buda Co. in Harvey, Illinois. Although built heavier for their power ability (0.475 hp/lb at take-off and 0.37 hp/lb at cruise), compared to gasoline engines (to withstand the elevated cylinder pressures/compression ratios), diesel aero engines such as the Guiberson A-1020, enjoyed a robust high-altitude capability, even with no supercharger. A ceiling of 18,300 ft. was attained in flight tests (still climbing!) and 20,000 ft. was projected for the Guiberson diesel radial. The A-1020 received A.T.C. No. 220 by the US government in April 1940. Diesel radials definitely cost more than gasoline aero engines of the same power output, in part due to the elaborate fuel injection system, as well as the beefed-up internal components. 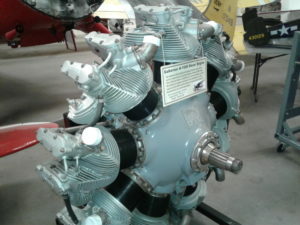 Guiberson produced 3 aero engine models: A-918, A-980 (used in the Waco 10), and the A-1020. The A-1020 was also developed into a light tank engine, the T-1020. Among the few aircraft applications for the A-1020 was the Stinson Reliant. Diesel radials did not catch on as a popular aircraft engine option for pilots, for reasons stated above. Packard’s diesel DR-980 was among those offered for sale. Manufactured by: Buda Engine Co.